The "Internet of Things" marketplace has been blowing up recently, and towards the end of last year we began seeing a lot of demand for security assessments of these types of platforms. To practice, we wanted to reverse engineer a consumer platform from scratch and look around for security vulnerabilities. What follows is the first of a three-part series on what we were able to do with the Dropcam. Through this research, we found the Dropcam has a pretty solid security model, so no 0day in this post. That being said, this type of reversing work is the most important prerequisite for finding security vulnerabilities, so we thought it would be great to share our findings and techniques with the security and reverse engineering communities. Hope you enjoy, and leave a comment if you have any further ideas to extend what we're showing here. For those that don't know, the Dropcam is a cloud-based webcam. It connects to the internet over WiFi, and users interact through it entirely via the dropcam.com web interface, or through a mobile app. We purchased some Dropcam cameras to find out more about how it works. In this series, you'll get an idea of how the process of reversing a device like the Dropcam works including the tools we use and how we use them. This project ultimately ends up going into hardware hacking, but as you'll see below, you can often gather a lot of information about how a device works before you open the case. Everything in this first post was done without taking the Dropcam apart, while our next posts will discuss taking it apart and some hardware hacking basics. As I was opening the Dropcam box, one of the first questions I asked was: how does it set up its WiFi connection? It's supposed to connect to your WiFi and present a configuration interface through dropcam.com, but it must have to learn at least your WiFi SSID first to do that. The documentation tells you to plug the USB cable into your computer and run through setup. idVendor 0x0525 Netchip Technology, Inc. The 32-character string in the URL is the unique identifier of my Dropcam. As you go through the web interface to set up the Dropcam, your browser eventually gets sent a JSON blob from a Dropcam web server containing a list of network SSIDs, BSSIDs, and other details of wireless networks near the camera. This data is presented in a list so that the user can pick which access point they want their camera to connect to. How does the server get the list of WiFi networks? It must be communicating with the Dropcam, but at first it's not clear how. When the device is plugged in to a USB port, the Dropcam appears only as a mass storage device so somehow a mass storage device is talking to the Internet through my computer? The executable ran in a Windows virtual machine with Process Monitor from the Sysinternals Suite inspecting its behavior, while I captured USB traffic and network traffic from the setup executable using two instances of Wireshark on my Linux host machine. The setup executable also started the Chrome browser in the Windows VM, which I configured to use Burp suite as a proxy. You can see that a SCSI Write command is being made to logical block address 0xa04, with length 4 (1). 0xa04 is 2564, which multiplied by the 512-byte block size is byte 1312768. The length 4 multiplied by 512 is 2048 bytes; this write corresponds to the highlighted WriteFile command in the Process Monitor screenshot. The data being written is shown in the hexdump (2) of the URB_BULK packet (3) following the SCSI Write command packet. What's happening is that the setup binary is communicating with the Dropcam by reading and writing network packets from and to a "magic" address on the USB mass storage "disk". By looking at multiple packets being sent over this USB channel and reading the setup binary in IDA, I was able to get an idea of the protocol. Above is a screenshot from the IDA Pro disassembly of the Macintosh setup binary (the Mac binary had more symbols and was easier to read than the Windows binary). 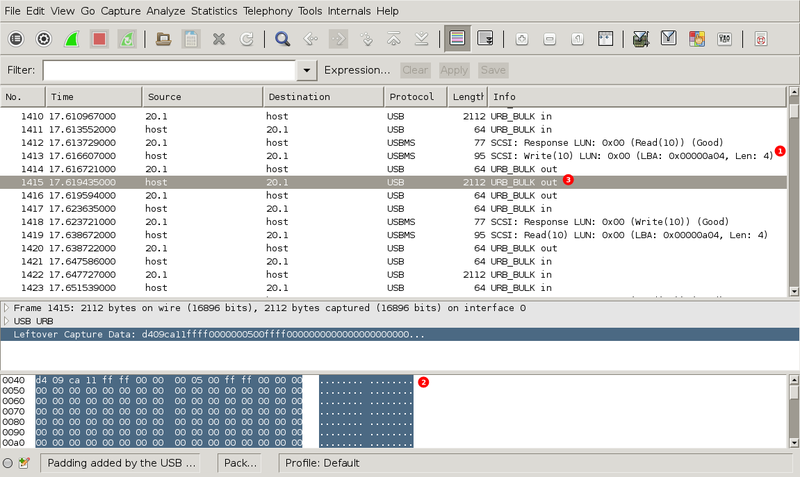 The screenshot shows a portion of the code involved in decoding received packets. All the packets that I captured started with the magic big-endian number 0xd409ca11. I found this code by searching in IDA for that number. You can see that that number (1) is confirmed to be a magic number by an error message that is reached when the first 4 bytes are non-zero and don't equal 0xd409ca11 (2). In addition, bytes six and seven (3) appear to be a big-endian sequence number according to another error message (4), and bytes 8 and 9 (5) turn out to be a big-endian length field. Also, the remaining two bytes – 4 and 5 – appear to increment from -1 in packets with no payload from the setup binary to the Dropcam; it is presumed that these are acknowledgment packets. 30 65 39 38 31 39 34 36 39 38 39 66 34 30 61 00 0e981946989f40a. d4 09 ca 11 00 00 00 01 00 81 03 00 01 00 7c 16 ..............|. 17 eb d7 4e 78 42 02 2e ef 7d 4b 14 d9 2b ad fe ...NxB...}K..+..
16 00 17 00 18 00 19 00 23 00 00 ........#..
82 03 01 30 82 01 e9 02 05 00 ed f7 59 0d 30 0d ...0........Y.0. 31 30 31 30 30 30 30 30 30 5a 30 3e 31 0b 30 09 101000000Z0>1.0. 70 63 61 6d 2e 63 6f 6d 31 10 30 0e 06 03 55 04 pcam.com1.0...U. 0a 13 07 44 72 6f 70 63 61 6d 30 82 01 22 30 0d ...Dropcam0.."0. The setup binary starts out by sending an initialization command to the Dropcam (command 00 ff ff 00 00). The Dropcam replies with a packet containing its UUID (so the setup binary knows where to point the web browser), and a host for the setup binary to initiate a TCP connection to (nexus.dropcam.com). After that, every packet contains a 5-byte sub-header (the first byte is 0x03, the last two bytes are a length field), followed by data. This same data was captured by my other Wireshark instance which was capturing a TCP connection made from the setup binary to nexus.dropcam.com via a TLSv1 connection. The Dropcam requests a TCP connection be made, and the setup binary tunnels all of that connection's traffic over the USB mass storage channel. So this is how the Dropcam connects to the internet: it appears as a USB mass storage device containing a setup executable to the host computer; the setup binary then tunnels a connection from the Dropcam over the USB link by reading and writing at a particular offset into the raw "disk" and connecting out to the internet using the host computer's internet connection. Meanwhile, the user is presented with a list of WiFi networks that the cloud server obtained over the tunneled connection. The user picks their network in the web interface, and types in their WiFi password. The selected network and password are then sent in a POST request to the cloud server, which pushes the password down to the camera, again over the tunneled connection. Something that users should be aware of is that this approach requires users to upload their network password to the dropcam.com server, and it might not be clear to a non-technical user that they are doing this. Dropcam (the company) probably isn't doing anything directly with the transmitted WiFi encryption passwords, but there's no guarantee that an attacker who could compromise the Dropcam cloud servers wouldn't. It's always a good practice to avoid sending confidential data to the cloud instead of making the setup binary directly communicate the WiFi information to the camera, so we're not sure if there is some other product architecture reason to do this that we're not aware of. The Dropcam makes two outgoing TLS connections over the USB tunnel. The first is to nexus.dropcam.com; that connection directs the camera to connect to an “oculus” server; my Dropcam connected to oculus101.dropcam.com. The camera itself makes the same two TLS connections over WiFi once it is configured; a short connection to nexus.dropcam.com followed by a long-term connection to an “oculus” server. The long-term connection is used for all of the camera's communications including streaming video, configuration changes, and firmware updates. After understanding how the Dropcam tunnels its TLS connections out over the mass storage interface, the next step was to attempt a man-in-the-middle attack on the TLS connections in order to capture their contents. However, the TLS connections utilize both client and server side certificate verification - when making the outgoing TLS connections, the Dropcam checks the server's certificate, and the server also checks the Dropcam's client certificate. Since the TLS connection endpoint is on the camera itself (not in the setup binary), I wasn't able to inspect the contents of the TLS connection until after I'd taken the Dropcam apart, which I'll describe in our next Dropcam blog post. Follow us on twitter @IncludeSecurity and check this blog again next week for subsequent posts in this Reverse Engineering series. 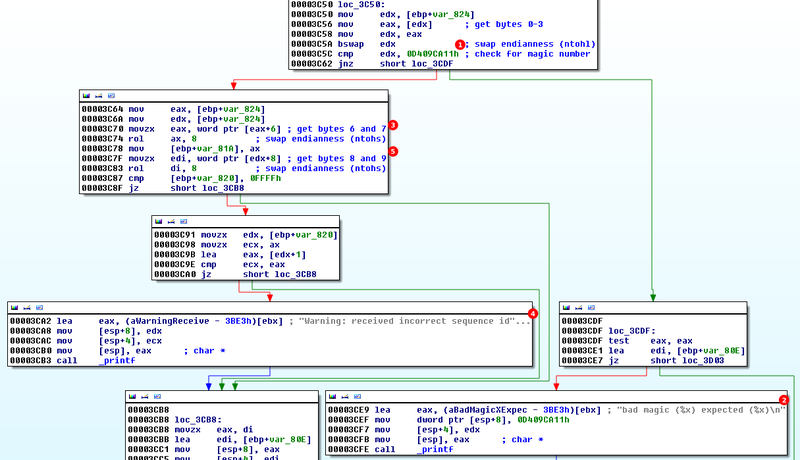 On January 31st 2014 a post appeared on oss-seclist  describing a bug in the Linux kernel implementation of the x32 recvmmsg syscall that could potentially lead to privilege escalation. It didn't take long until the first exploits appeared, in this blog post we'll walk-through the vulnerability and Samuel's Proof-of-concept exploit in detail. The bug is located in the x32 version of the recvmmsg syscall in the Linux kernel. The recvmmsg syscall allows for receiving multiple messages on a socket with just one syscall (and can thus increase performance in certain situations). To be clear the x32 ABI (not to be confused with the X86 ABI) is a particular ABI and that is not enabled by default on all distributions. However, recent Ubuntu-based distributions as well as Arch Linux ones have enabled it. For more details on the x32 ABI refer to . In short x32 is an ABI which takes advantage of the 64-bit environment while using 32bit pointers for less overhead. However, the x32 system calls can also be accessed by standard 64bit applications by setting adding the value of __X32_SYSCALL_BIT to 64bit system call numbers. The CVE 2014-0038 bug is a fairly classic case of trusting user supplied input. The timeout pointer in the function below is passed directly from user space to __sys_recvmmsg, which expects a trusted pointer, without first copying the value of the user supplied pointer to a controlled kernel space variable. Pointers passed from user space are marked with the __user attribute to make sure they are only accessed through the user space API functions (e.g. copy_to_user, copy_from_user, ...). In this case though, the timeout parameter is cast directly to a type not containing the __user attribute, and then passed on to __sys_recvmmsg without any further checks on it. At -1- the timeout struct is copied into a kernel space variable before passing it to __sys_recvmmsg. That's the correct way to do it. Now let's take a closer look at what happens to the timeout pointer passed from user space. The first thing to note here is the block at -1-. Here poll_select_set_timeout will set end_time to the time when the timeout will be over. More importantly, it will check whether timeout points to a valid timespec struct. If it does not then it will return -EINVAL and thus cause the syscall to fail. At -5- the first long, tv_sec, is checked to be a positive number, meaning it's most significant byte must be smaller than 0x8, and at -6- the tv_nsec member is checked to be smaller than 1,000,000,000 (= 1 second), so tv_nsec must be between 0 and 0x000000003b9aca00. Keep this in mind as we move on. Next the code enters the loop at -2-, waiting for incoming packets. After a packet has been received by __sys_recvmsg the timeout struct is updated to contain the time left (-3-). If that value is < 0, both tv_sec and tv_nsec are set to zero at -4- and the function returns. The loop will thus exit if either vlen messages have been received or the timeout is hit after receiving a packet. Do note the call will only return after a packet has been received, even if the timeout has already been hit. By sending packets to ourselves from a forked child, we can enter the code that updates the timeout at any time. And by setting vlen to 1, we can guarantee that timeout is only written to once. So what can we do with this situation from an exploitation perspective? The basic idea that comes to mind is pointing the timeout pointer to sensitive kernel data with known content and waiting a specific amount of time until sending a UDP packet (thus reaching the block at -3- in the code above). This will cause the function to update the timeout structure and return. In other words we will make the kernel treat some of its own memory (preferably a function pointer) as the timeout argument and thus cause the kernel to overwrite part of its own memory. This allows us to write a nearly arbitrary value to an address of our choosing (we have 64bit pointers so we can address the whole address space), as long as the original value is known and there is a valid timespec struct at that address. Since kernel pointers always have the high 4 bytes set to 0xff they make a good target. If the address of the last (most significant) byte of the pointer is passed as a timeout, waiting >= 255 seconds will clear that byte without mangling up adjacent data as the whole block is set to zero. Repeating this for the next two bytes will allow us to point that pointer into user space (this is what the original version of the exploit did). To speed things up the bytes can be cleared in parallel. For this to work the time between the syscall and the incoming packet must be > 254s and < 255s. This will cause the recvmmsg function to write garbage to the following two longs, as they are treated as tv_nsec value and will then contain the remaining nanoseconds of the timeout. Now let's start with a brief overview on the steps the exploit takes to get root privileges. The exploit follows the common scheme of tricking the kernel into executing code in user space memory. This has quite a few advantages, including being able to write the payload in nicely readable C code. For a more detailed discussion of this technique refer to . Allocate executable and writable memory at the address to which the kernel will jump, and copy the kernel payload at the end of that region. Target the release function pointer of the ptmx_fops structure located in the .data section which is writable kernel memory. Zero out the three most significant bytes, thereby turning it into a pointer inside of the region mapped by user space. Open /dev/ptmx and close it, causing ptmx_fops->release() to be called. Check if root privileges were obtained and start a shell. Let's examine each of those steps in more detail. They can be taken from /boot/System.map or the decompressed kernel image via nm. The PoC linked at the end of this post also contains a script (build.sh) which will help resolving with the symbols. The README in the PoC provides details on how to use it. The first thing the exploit does is allocate executable and writable memory at a fixed address. TTY_RELEASE is the original value of the targeted pointer in kernel space. Since the three most significant bytes of that pointer will be cleared, a mask of 0x000000fffffff000 has to be applied to it. The memory region is then filled with nops and the kernel payload (discussed later) is copied into it. This is the key part of the exploit, we're abusing the bug as discussed in the "Exploitation Vector" section. After a lot of code to set up the structures needed for the syscall, the passed address is used as the least significant byte of the timeout pointer (-2-) and the vulnerable syscall is called. At -2- the forked child process will wake its parent so the time difference between the syscall and the incoming packet is between 254 and 255 seconds, thus setting the least significant byte of the tv_sec member to 0.
ptmx_fops->release now points into the memory region that was mapped at the beginning. At this point we are ready to execute our payload in ring 0 by opening a file descriptor to /dev/ptmx and immediately closing it, causing the kernel to call ptmx_fops->release in the current context. Now if all goes well (see restrictions further down) the kernel will jump to our code, change the creds structure of our process to a new one with root privileges (and all capabilities) and return to user mode. Let's take a closer look at how that is done next. This is the function copied into the end of the allocated buffer at the beginning. The kernel will execute this code during the close syscall and then return back to user space. The kernel payload uses an old approach which has been documented by Brad Spengler (Spender) in his enlightenment framework  (see exploit.c). Basically, after restoring the manipulated memory region, a new cred structure with full privileges is allocated by prepare_kernel_cred and afterwards passed to commit_creds to install it upon the current task. Since the exploit needs to resolve the tty_release and ptmx_fops symbols anyways this approach was chosen. It would also be possible to change the credentials without calling any helper functions in the kernel. This can be done by looking for a pointer to the cred structure stored in the task_struct for the current process, which can in turn be found at the beginning of the kernel stack. By searching for memory that contains the current process uid and gid and setting those to zero, root privileges can be acquired as well. For an example demonstrating this technique refer to the semtex.c exploit . Since the exploit relies on timing it might be unreliable if the exploited system is under very heavy load. If the kernel fails to reschedule the child process to wake up its parent on time (meaning within a second) the pointer will get corrupted and the exploit will fail, causing a kernel Oops. In this case a non-threaded exploit which clears the bytes sequentially can be used. You'd want to wait 255 seconds for each byte and this guarantees that the whole timespec structure will be zeroed out when waking up the parent. This approach takes 3 times longer as the parallel version though, so approximately 13 minutes . I have tested the parallel version on a system under heavy load (100% CPU usage) multiple times and have not seen the exploit fail, so I assume this to be more of a theoretical issue (setting up the sockets and rescheduling a process within one second is really no big deal, even under stress). The original non-threaded version of this exploit in theory works reliably vs. the threaded version, but does take a while to execute. Since the exploit tricks the kernel into executing user space pages it can be stopped by SMEP . SMEP will cause the CPU to generate a fault if it is executing code from a user space page in kernel mode. Think of SMEP as kind of a DEP/NX for the kernel. To bypass SMEP the 20th bit of CR4 can be cleared through a ROP chain. Afterwards executing code in user space is possible. This technique is described in further detail in . If no gadgets can be found for writing to the CR4 register exploitation would still be possible by writing the payload in ROP entirely. Also see the post in .